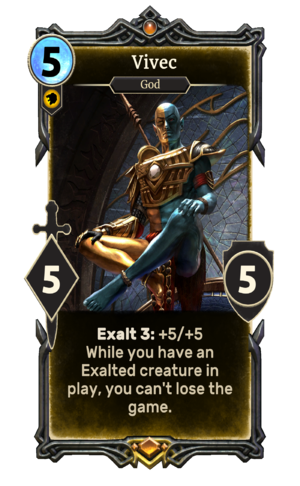 Vivec is a unique legendary Willpower creature card. It is part of the Houses of Morrowind expansion. "Godhood is like juggling – things are always moving." "Let the faithful hold back the darkness as I have written." "Feel the wrath of a living god!" The card's ability applies the Vivec's Protection card effect to itself and the Immortal effect to you. The card's exalt ability applies the Warrior Poet card effect. This page was last modified on 1 March 2019, at 23:49.